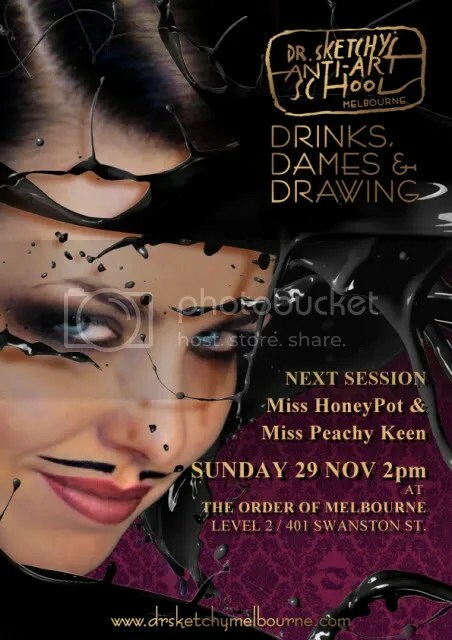 Dr Sketchy’s Anti-Art School Melbourne “Over The Top, Why Not!” end of year session! We bring you Nick Cave, Kylie Minogue, roller skates and Pink Flamingos! Melbourne burlesque, cabaret and vaudeville agency, “Eyelash”. and events (Ain’t No Sin, Melbourne International Comedy, Very Very Variety, Sacred Heart Community Cup Festival) around town, these ladies unleash a cocktail of tease at our upcoming session THIS NOVEMBER 29th. Miss HoneyPot premieres her amazing rollergirl routine! Miss Peachy Keen’s vaudeville rendition of “where the wild roses grow”… Is she Arthur or Martha?! Who knows, but everything is comin up roses! only days before they take flight to this years Meredith Music Festival! How much more can a sketcher want to sketch! Join us this Sunday November 29th, 2pm at The Order of Melbourne!